The form of bots known as chatbots is becoming increasing popular. Chatbots are designed to appear as if the user is having an online chat with another human being instead of a computer. Some companies are currently using chatbots to handle certain requests for customer service, allow customers to place orders for food or offer suggestions about cosmetic products. The underlying technology that powers bots has been available for several decades. One of the earliest examples of a chatbot was produced in the 1960s. Named ELIZA, it was a program in which the computer assumed the role of a Rogerian psychologist. Humans interacting with the program would type in a statement, and ELIZA would respond. The computer's responses were normally questions. For example, if the "patient" typed in, "I'm angry with my husband," ELIZA might respond, "Why are you angry with your husband?" Many users believed that they were actually interacting with a human psychologist, and some people continued to praise ELIZA's insight and empathy even after they were told that they had been chatting with a computer. Although several bots were developed during the 1980s and 1990s, the one that caught the public's attention was released in 2001. SmarterChild was a chatbot that was available on MSN Messenger and AOL Instant Messenger from 2001 until 2007. Originally, SmarterChild was designed to provide information such as detailed information on sporting events, weather forecasts, news, movie screening times and stock reports. It quickly became a marketing tool; users could type in questions and receive instant responses. Radiohead, a popular rock band of the era, had a chatbot that fans could use to ask questions about tour dates, song lyrics, upcoming albums or other band-related issues. Companies such as Keebler and Intel also had chatbots. 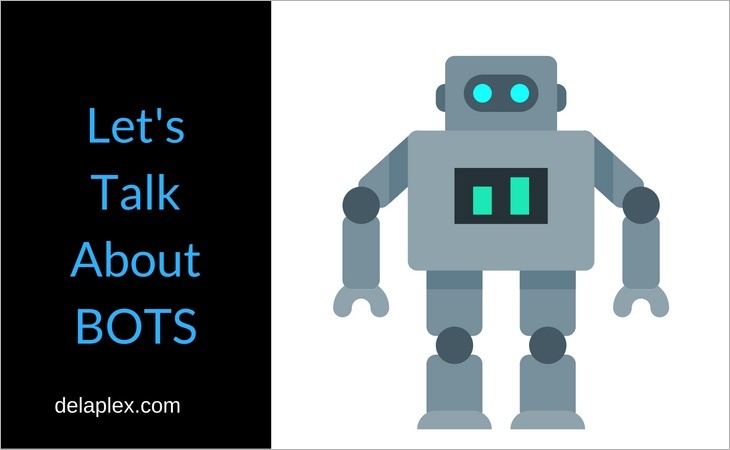 In the last two or three years, the interest in bots has exploded. Facebook, for example, recently announced that companies will soon be able to create their own chatbots and put them into the social site's messenger service to interact with customers. Users can order a floral arrangement or a pizza by using a chatbot, and there are bots that can be used for online shopping. For example, a user looking for shoes may be prompted to provide his shoe size, the style of shoe he wants, his price range and other pertinent details. The questions are asked as if they were arising during a natural conversation. Once the answers are provided, the bot quickly performs a search and returns a list of links to products matching the user's specifications. Why the Surge in Popularity? The primary reason that chatbots have increased in popularity is the recent advances in the technology surrounding artificial intelligence. Most chatbots are designed to "learn" through interactions with humans. They can remember information from previous conversations, but they can also begin to anticipate what each user might ask or what the user might like. This makes them different from bots that simply answer questions about the weather or restaurants in the area. Will Bots Spell the End of Apps? With all the hype surrounding bots, many people wonder whether bots will soon replace apps. Most experts do not believe that apps are going away anytime soon. Apps and bots perform different functions and typically appeal to different groups of users. Bots are useful for finding a specific answer within a large set of data, but apps are better if the user wants to see a great deal of data at once. For example, if a user wants to see all transactions in his checking account for the last two months, an app is the better choice. However, if he wants to know the total amount that he spent at Walmart last year, a bot would be superior. Similarly, if all the user wants to do is to verify the balance in his checking account, a bot would be faster than loading an app on his smartphone, entering his credentials and selecting the account. In addition to the marketing bots already discussed, bots can provide useful functionality for a number of other purposes. Occasional or one-time mobile transactions: An ever-increasing number of consumers prefer to use their mobile devices to conduct business. However, if the website is not optimized for mobile, this may be difficult or impossible. If an app is required, users may be reluctant to download an app that they will seldom need. Bots can be used for these transactions for both sales and marketing. For example, a bot could allow users to purchase a ticket for an upcoming concert or allow them to download a coupon. Give small businesses access to mobile commerce: A small business that receives much of its revenue from local buyers may not be able to justify the expense of a mobile app that few people will ever use. A bot could provide the interface that such businesses need. Enhanced customer support: Most customers need help with the same issues. Using a bot to automate responses can improve the customer's experience while freeing staff for other issues that require human intervention. Proprietary solutions: Repetitive tasks that employees may need to perform can be easily handled with bots rather than mobile apps or a website. For example, a company that updates parking credentials monthly could use a bot to allow employees to renew their passes. Customer engagement: Delivering an engaging, personalized experience to customers is a crucial part of marketing. Bots could be used to allow customers to enter drawings, retrieve personalized offers or play games that award special offers as prizes. Reducing choice sets: Because a bot can recall the user's likes and dislikes, location, budget and other criteria, bots can be used to reduce the number of recommendations offered to the user. For example, a user looking to make dinner reservations will not be confronted by hundreds of possibilities that are outside of his budget or that do not serve the type of food that he likes. Deliver marketing messages using a unified API: Twitter, Teamchat, Slack, SMS, WeChat and other services connect with a unified API. This simplifies the marketer's task when pushing messages. Whether you are interested in bots to automate your messaging and social media interactions or need bots that will offer additional functionality, delaPlex Software can help. We are headquartered in the United States with a team of highly skilled and knowledgeable developers working in India. We will assign a dedicated team to your project, and our team members will function as your virtual employees and technology partners. If you would like to learn more about the many ways that delaPlex Software and our exceptional employees can assist you with your business goals, contact us today.